Imagine having one of the worst days of your life – everything is going wrong, you are thoroughly annoyed with everything and everyone, and you can’t wait for this day to end. Now what if you wake up the next morning, and find out that you have to go through that same day all over again? And what if this would keep repeating itself…? 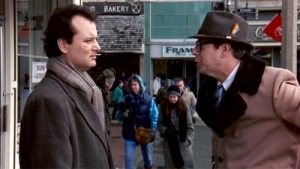 In the movie Groundhog Day, Phil Connors is a nasty, egocentric, sarcastic and selfish weatherman of a local TV station in Pittsburg who thinks he is Mr. Perfect. He doesn’t like his job, his colleagues, or most other people for that matter. As he puts it: people are morons. All he cares about is himself and his happiness. When he is sent to a small town called Punxsutawney to report a local tradition of a groundhog predicting how much longer the winter will last, there is only one thing on his mind: finishing the job and leaving that small town with its simple people as soon as possible. Initially Phil panics. He decides to go see a psychiatrist, who tells him: “This is an unusual problem Mr. Connors. I think we should meet again. How is tomorrow for you?” at which words Phil becomes even more depressed. From this point onwards, Phil stops following the rules and does whatever he wants. It doesn’t matter if he ends up in jail or worse, as he again wakes up in his hotel on the same day. He gives in to all his fantasies, and starts learning from previous experiences, not making the same mistakes over and over again. Just like in the ancient scriptures, this story shows a mind, or soul, going through repetitive existence, experiencing the same world over and over again, and in the process exhausting all its karma or past impressions. Whatever desires, cravings and aversions are there, are all lived through and experienced until one becomes satisfied, contented, or simply realizes their impermanence. This happens when Phil realizes that he has fallen in love with Rita, a kind female producer from his TV network that came with him to Punxsutawney. He has now lost taste for any other enjoyments. A similar thing happens to a spiritual seeker who has found his Master, or Guru. Being the most attractive, the Master becomes a lightning rod for all the disciple’s longing – it is the last desire, the desire that removes the taste for all other desires. And finally, this last desire is also dropped, and one becomes free. Using different approaches, Phil tries to get Rita to fall in love with him, but every time he ends up getting slapped in the face! Over time, he becomes desperate, because whatever he tries is not working. He becomes depressed and starts committing suicide in many different ways, trying to end this repetitive existence. But every morning he wakes up in the same hotel again on the same day. When he realizes that there is nothing he can do to alter his situation, something changes. He starts becoming a nice and caring person, helping out wherever he can. He has dropped the one last desire! In the end he becomes a ‘perfect’ guy, available to help anyone at any time, humble and caring. That night, Rita stays with him to keep him company. Phil tells her: “No matter what happens tomorrow, or for the rest of my life, I’m happy now.” This is the final destination of a spiritual seeker: accepting one’s place in the bigger picture, without any personal needs, one starts serving the society and the world in whatever way one can, being totally dispassionate and fulfilled. And once this beautiful state of fullness dawns, one becomes free from the cycle of repetitive birth and death, Samsara. Peaceful Warrior is on the ‘to do’ list ;). I have not hear of Never Back Down… I’ll check it out.. thanks for the tip! curious to see the movie now after reading this review….and yes,lucky we to have learnt the importance of living in present! I have not seen the movie however I have some doubts regarding the theory of karma….When you see very young children suffering like anything…living in appalling conditions they say it’s because of their karma of past life. May be true…but a century ago world’s population was less than 2 billion today it is 7 billion. Agreed the 2 billion that were already living would face the consequences of their karma in past life….What about the remaining 5 billion.? Interestingly it also poses question on the fact that if soul can neither be created nor destroyed how is the population of world increasing ?? 🙂 I have been looking for these answers and have utterly failed to find one. – Not all ‘souls’ would have to be on this planet at the same time.. there might be many billions, coming and going at different times… right now there are 7 million, later it might be more, or less again? Two as Alex has already indicated – that soul exists only in the realms of earth. Both of which is yet to be conclusively established definitely by Scientific knowledge and to some extent also by our scriptural knowledge. Agreed Guruji said that I have heard about that too…but that confused me even further… If you take a look between cause and effect relation its other way round…..Human population is not increasing because species are getting extinct……but species are getting extinct because human population is increasing & we kill them directly or indirectly for our needs……secondly…..if humans die untimely death they are reborn as humans to complete and balance their karma balance-sheet….so with that logic how are lower species directly promoted to humans just because we kill them? Also considering the unprecedented number of crimes committed…moral or legal crimes and number of wars and bad karmas going on in the world….shouldn’t a large number of humans be demoted to some low lying creatures which means population of other species should increase. Alex very nicely written. The analogy is so true. It reminds me of how yoga Vasishtha keeps telling Rama of repetitive cycle of birth and death. Thanks. Also Rita can stand for the Love that is greater than the love for your small mind, ego….when you realize that that true happiness happens when you share your best, your happiness, your love with others..
sir u have written such a great lines. made clear about the karma and reincarnation topic. thnks u very much. i am so excited to watch the movie groundhog day. Interestng perception! !Thank you so much 4 sharing this.. Such a beautiful insight to one’s spiritual sojourn.Thumbs UP…well presented!! a really really nice explanation! This is a wonderful similarity to make! I thoroughly enjoyed reading this and am happy to see I’m on a good path in life. Thank you!! Alex, this is a great sharing. I haven’t watched this movie. But after reading your blog about the hidden spiritual messages contained in the movie, I am waiting to watch it as soon as I can. Phil’s unchanging situation as described by you reminds me of a satsang with Gurudev Sri Sri Ravi Shankarji. In the satsang, while answering a question, Gurudev suddenly started moving his hands like a carpenter sawing the wood and made the sound as well. The hall had gone into pin drop silence. He asked, “What if you had to spend your entire life doing just this? Are you ready?” I still get goosebumps when I remember this incident. amazing!!!!!! I had a good start of the weekend by reading it! will watch the movie , got something knowledgable and resourcefull to look forward too .. I saw the movie & its true in one way I’m living the same day again & again. For example last year I changed the city, now I’m working in different city but I see some of my desires & hatred remained same, now it is attached to new set of people. Some of my actions are just same like before, now I know what my next action after I get bored, when I get tired….Unless I do something different, the result is going to be same.